Here is an article written back in 2007, and published on the UBR website. It is talking about potential fights that may happen and the most anticipated fights of the time. Fights listed in weight division order of the fights that realistically have a chance of happening and that we would all love to see. Valuev has escaped too long without fighting a decent opponent, he at last faces a decent opponent in the form of Chagaev, he might struggle here but a win will move closer to claiming a possibly undeserved record that has stood since the days of Rocky Marciano, of 49 straight wins. Hopefully one of the Klitschko brothers can do something about that. Vitali is the best of the two and would have a great chance of beating Valuev. Still and anticipated fight that may still happen, Valuev lost to Chagaev but still now holds a title, he faces David Haye next and a win here will match him with one of the Klitschko brothers, saying that he may well not get past Haye. Haye has clung on to remaining at Cruiserweight to claim the world title. Mormeck proved he will be no push over since beating O’Neil Bell to set up this clash of the Titans. Haye has proved he has overcome stamina problems that he had in his defeat to Carl Thompson, when he was knocked out after punching himself to a standstill. It will answer a lot of questions about both fighters. I think Haye will prove to big and too powerful for Mormeck. This fight actually happened and Haye won via a late round stoppage, it was a good fight and Haye was actually down himself during the course of the fight. Woods deserves a big fight before he retires. Roy Jones would have been nice, but a win wouldn’t give him the credit as Jones is regarded by many as washed up. Tarver, although beaten by Hopkins is still a great draw and it would be a tough fight. Woods would have to show the grit of his last fight with Glen Johnson to get the win, but I think he is capable of it. Tarver has competed at a higher level and it would also depend where the fight was, I think if it was in the US it would be Tarver's fight. 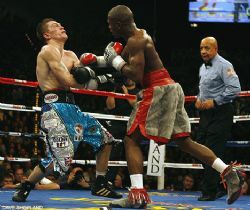 This fight happened in the US, it was a dull fight and Tarver won on points. What does poor Calzaghe have to do to prove that he is the best around. He has destroyed all comers so far and I believe Kessler will be in the same boat. His record is a little flattering at 39-0 but who has he really beaten? He only really stepped into world class 4 fights ago, beating Anthony Mundine on points, a man who was knocked out by over rated Sven Ottke. An over the hill Markus Beyer and untested Librado Andrade. Calzaghe would have destroyed all of these, but to shut everyone up Calzaghe will have to put an end to Kesslers unbeaten run and at last prove he is the man in the division. Although I am sure after beating Kessler there will be rumours that he wasn’t actually as good as we all thought, ring any bells Jeff Lacy. This fight happened and Calzaghe won, but Kessler gave him a good fight, Kessler started better possibly winning the first 4 rounds before Calzaghe took over and won well on points. A lot of questions were left unanswered after the first fight that was scored a little wider than expected. Miranda is a concussive puncher but Abrahan is tough and still unbeaten. Miranda deserves another roll of the dice and it would set up another fantastic fight. It was a decent fight and Abraham won surprisingly quickly, he soaked up the pressure from Miranda before taking him out in the 4th round, nevertheless good fight. Spinks has taken the other route and is taking on Middleweight Champion Jermain Taylor, this will be too far for Spinks and he will be outsized and outgunned. Spinks v Powell would be a great fight their styles would suit each other and it would prove a great 12 round war. This fight never happened due to Powell being surprisingly stopped by Deandre Latimore who took his place against Spinks and lost a close decision. The old against the new, Mosley is proving with every fight that he still has what it takes to beat the best. At the moment the best is Cotto, strong and a brilliant boxer, proved he has the guts to make it after rising several times against big puncher Ricardo Torres before returning the favour and sending Torres crashing to the canvas for the count. He has also out boxed skilled technician Paul Malignaggi. Mosley will be able to take Cotto’s power and give him a little taste of his own medicine. Will be a fight of the year if not better. A decent fight, Cotto won on the cards but to this day many beleive that Mosley did enough including myself, if Cotto beats Pacquiao and Mosley beats Berto these two may get it on again. The icing on the cake for Hatton if he manages to make this fight happen. His work rate will be too much for the skilled Mayweather but as Mayweather has proved in the past, he can stand toe to toe with the best, if needed. The only problem is I believe Mayweather will fall short against De La Hoya and not be the force he would have been, stepping in undefeated. Either way it would still be a fantastic fight and will escalate Hatton to the heights he deserves. Mayweather is the best fighter we have seen in the last century, he might not be the best to watch but you have to take your hat off to his ability to build a fight plan and follow it. Ricky Hatton came in blazing but his tactics failed and he had no plan B to fall back on, Mayweather won via a tenth round KO. Casamayor will want revenge for the defeat in the first fight, which was a cracker. Freitas is always exciting and having these two back in the ring together is a mouth watering thought. I will edge Freitas to win again but Casamayor will push him all the way. In the first fight Pacquiao knocked down Marquez three times in the first round and the fight looked over. Marquez climbed off the canvas and out boxed Pacquiao for most of the rest of the fight, ending in a unsatisfactory draw. With Pacquiao beating Morales and Marquez beating Barrera these two have set up the final rubber match to mark the best in a highly rated Division. It is a coin toss really who would come out the winner but is guaranteed to be one of the best fights ever. Another great fight, Marquez did enough but Pacquiao won the decision. Cook deserves a break after the Scott Harrison fight fell through. John is currently the best in the division but with both men undefeated, as they say someone’s 0 has got to go. Cook is a busy brave fighter and will push John all the way, the only mark on John’s record is an avenged draw with Jose Rojas. John definitely has the more experience and has been in with far more talented fighters than Cook, but Cook is hungry and on his day can beat anyone. This however would be a bigger test than he has ever had. Never Happened, may still be one for the future. Molitor came over to England recently, relatively unknown, but took our highly rated Michael Hunter to pieces. De Leon is a power puncher and apart from an upset to Celestino Caballero, De Leon has looked unbeatable. He didn’t have his own way in his last fight against Gerry Pensola, who gave him all sorts of problems. Molitor is unbeaten and it sets up an amazing bout.